There are invisible heroes, walking around the streets that you may not know about. They are the catadores. They go around cities, picking up trash off the streets and into their carroça, and then selling the trash at a very low price for a form of currency. 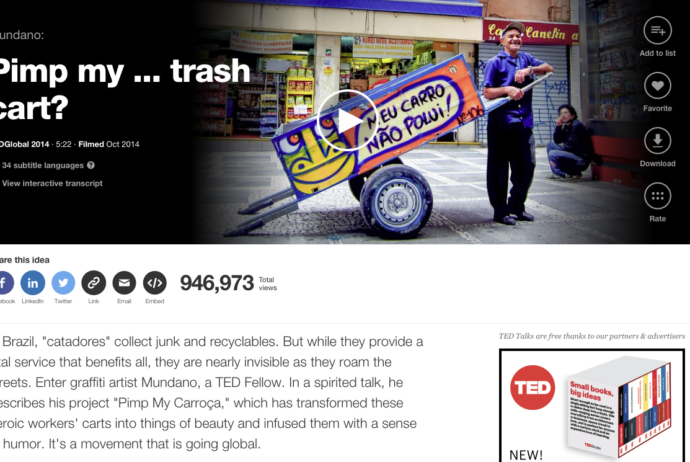 Mundano, a graffiti artist and TED Fellow, created a project called “Pimp My Carroça” in order to promote the catadores through art and community. He wants people to recognize these heroes in not only Brazil, but around the world. Click on this link to listen to the whole video about Mundano’s inspiration in forming this worldwide project. His project is actually very similar to what Pick’n Run is trying to do.